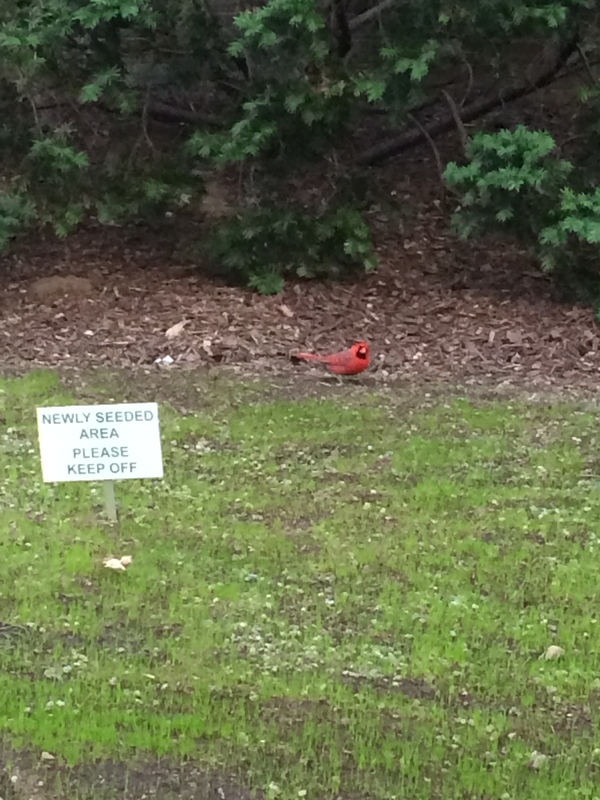 Or better yet…Cardinals rule!! The cardinal has long been a favorite bird of mine (and my mom’s), maybe it’s the plumage, maybe it’s the distinct call they make, or probably more to the point, it’s the way their color cuts through just about any nature scene. I hear them chatting to each other all the time, and it’s comforting to me as I navigate the cityscape on a regular basis. I can usually find the source of the call when I have time to stop and look, but sometimes, I am gifted with a clear sighting. This picture was one such gift, but also very poignant as well. What sign? You see a sign? I don’t see a sign. Even in the midst of sirens, and babies crying, and cars honking, this beautiful bird gave me pause and a chance to chuckle at the irony of it’s landing spot. I can only hope it found some nice grubs to bring back home in that newly seeded lawn. Hope you’ve had the chance to take pause, but more so, that you’ve had the chance to chuckle! While we don’t have a cardinal Totem (yet), we do have Owl, and Owl is definitely awesome. If you want Owl to help give you pause, then click on the link on the side of the page and get one today!